Once upon a time, in a galaxy far far away, a brand new alphabet was born. One where A stood not for apple, but for AT-AT. And B for bongo. While Z stood not for zoo or zipper, but for Z-VT 49 Decimator. Yes, people, welcome to the world of the Star Wars alphabet. 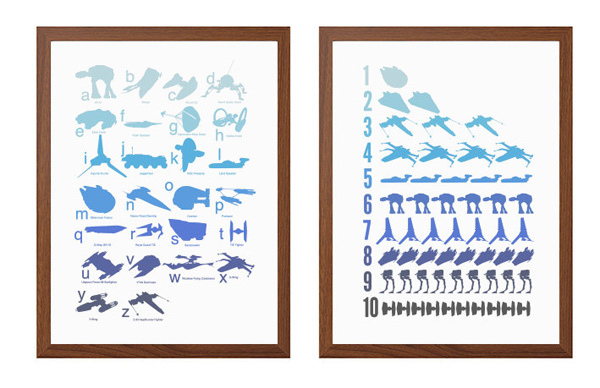 These fun posters from Sydney design studio Seal are just the thing for adding a bit of Star Wars-inspired geek sci-fi chic to the nursery. And let’s face it, there’s a hell of a lot of dads who’d be secretly thrilled if their baby’s’ first words were AT-AT rather than the usual ma-ma or da-da. 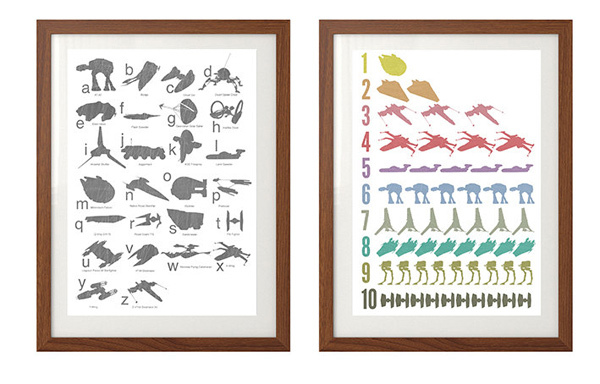 If an alphabet poster full of Star Wars vehicles isn’t enough to have you swearing eternal loyalty to the Jedi and reaching for the nearest light sabre, then perhaps a matching numbers poster might sway you. It goes from one millennium falcon all the way to 10 tie fighters in splendid graphic style. The posters are printed on archival paper, so they’ll look good for years and years, most likely right up until your Star Wars baby is having babies of their own. Choose from mono, rainbow or navy prints, or a combination. 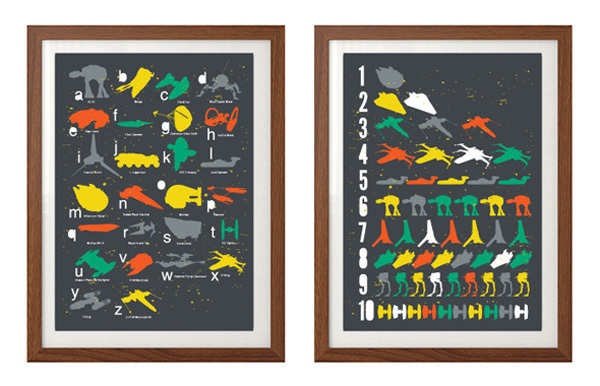 A unframed set of alphabet and number Star Wars posters costs $33 or you can buy posters individually too for $19. Or upscale to A3 size from $45. Shipping anywhere in Australia costs an extra $5.50. Whichever you choose, may the alphabet force be with you.